Welcome to the Letter U where we’ll be having fun with Umbrellas! Read Chicka Chicka Boom Boom and put up the letter U on our Alphabet Tree! You can download my small alphabet letters here. Umbrella Shape Puzzles: Cut out each umbrella, then cut in half for shape matching puzzles. Umbrella Counting! This game is for counting practice. Simply cut out along the lines so you end up with squares. Have your child match up the cards by matching the number of raindrops to the card with the appropriate number on it. Umbrella Color by Number: We color this, paint it, or use markers. I found some that fit my 3 year old well, they’re called Pip-Squeaks Washable Markers. They’re shorter and easier for her to use. These pictured are chubby markers, they also make a skinny version. Letter Poking Page: I found this fun idea on Activity Mom. Instead of tracing, we are going to use a toothpick, or we have these cute Oversized Push Pins, to poke holes through the paper in the shape of the letter. Print on regular paper for easier poking, and do this one on carpet 🙂 Another idea would be to hole punch along the lines of the letter as well. Both work on motor skills! Umbrella Size Sort: Put these in order small to big or big to small then discuss which is largest, smallest and medium. Letter U Scavenger Hunt:Fill the box with things that start with U! Some ideas: umbrella, unicorn, underwear, untensils. Umbrella Number Practice: I laminate this and use with Expo Dry Erase Markers for pre-writing practice skills. Umbrella Puzzle: Cut along the guides for a fun 6 piece beginner’s puzzle! Umbrella Pattern Activity: Cut out the pieces on the bottom to complete the pattern,this works on pre-math pattern skills. Umbrella Letter Matching: This is a fun letter matching activity, use your letter disks to match the letters on the page. Click here to see the process of making the letter disks. Umbrella Lacing Card: I make sure to laminate this one for durability, then punch with a hole punch every inch or so for lacing practice. Teach them patterns to do with this as well, like up from the bottom each time, or in-out-in-out sewing. Whatever pattern you can think of. Capital/Lowercase Uu sorting: Simple, just sort out the attached uppercase and lowercase letters. Umbrella Graphing: I laminate this and then have them either color in the dots with Expo Dry Erase Markers, you could also use bingo markers, or whatever manipulatives you choose. Umbrella Floor Numbers: I made these large floor numbers so that we can play a hopscotch type game. I call out a number and she jumps to it! You could also have them put the cards in numerical order. The number cards go from 1-10. Here’s a sample of her in action from Letter V week. 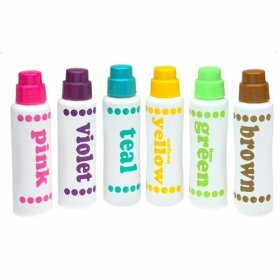 Uu Do-A-Dot Worksheet: We use Do-a-Dot Art Markers with this! Umbrella Cutting Practice: Simple print and let your child try cutting along the lines! Umbrella Color Puzzles: I cut these little guys out then cut them in half in as many interesting ways as I could think of to make color matching puzzles. 11 x 11 Pin Geoboard: We use these to make letters, numbers, shapes etc! Letter U umbrella craft: I got the idea from No Time For Flashcards site, they have a ton of craft ideas! Play Balloon Volleyball: A good friend of mine over at 7renfros suggested a fun game called “Balloon volleyball”, its basically a toddler-friendly version of regular volleyball. Kids take turns batting a balloon up in the air, with the goal of trying to keep it off the ground as it floats downward. You can shout out words that start with the letter “U” each time you hit the balloon! Thanks Melissa, great idea! Letter Hunt: I created some Letter Hunt worksheets that you can download. Foam Letter Builders: I cut the shapes from foam and let her use them to make the letters. 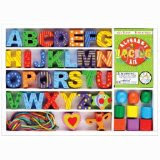 You could also use my Magnetic Letter Builders as well! Kumon ABCs Uppercase Write & Wipe Flash Cards, they also have lowercase cards and Numbers. 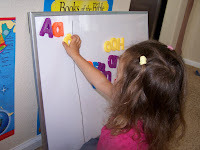 Magnetic Alphabet Builders: You can download the magnetic alphabet file here. I have a Xyron 9″ laminator and I found some magnetic laminate from Joann’s. (Use a 40% off coupon as its a little pricey!) I rolled the printout through the magnetic laminate and cut it out and voila! Family Fun Night: Have some Udon Noodles or Ugli Fruit and watchUp! 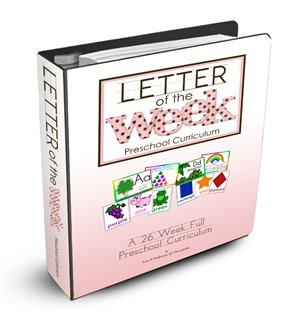 Note: To get all of the games in my Letter of the Week curriculum, please check out the full curriculum in my store! See my Money Saving Tips for help with printing, laminating and FAQs! THANK YOU!!! What wonderful resources!! What a blessing! Thank you so much for sharing your God-given gift with the rest of us!! This is wonderful. Thank you so much for sharing! My biggest obstacle for doing home education at home was the “where do I begin” syndrome. Now I don’t feel so lost. Can’t wait to get started! Am I missing it, or does this letter not have a coloring page, per-se? I clicked over to Honey’s blog looking for the letter matching cards you refer to in Vowel Review, but I am not finding them. Your link is to her site, not the actual activity. Any help would be appreciated!! Thank you, Erica!! This is AMAZING!!! Would you be capable of guide me in your internet marketer or person which manages your site, I must determine it might be easy to be described as a visitor poster. WOW! I am a librarian and do children’s story times. Your printables will be an invaluable asset! Thank you so much! I don’t know if I’m missing it, but on a lot of your other free posts the items are bundled into one download; here I’m not seeing the link to download it. Is it still available to download for free? Do I need to click on each link above and download that way? Thanks for the help and great work that you’ve done…we started school today using your Pre K Daily Learning Handbook and a few other things I’ve found. Great material there, too! Love, love, love your stuff but am having problems printing it!!! Please give some advice/help on that!! Thanks and God bless!!!! are you having troubles printing, or downloading? If you email me I can be of better assistance!